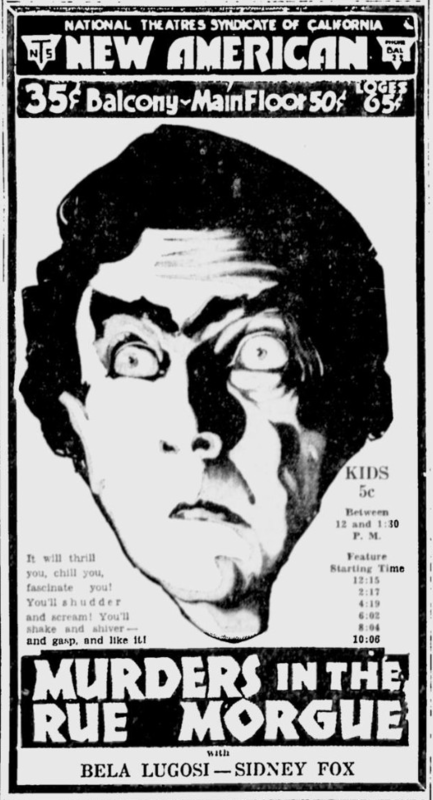 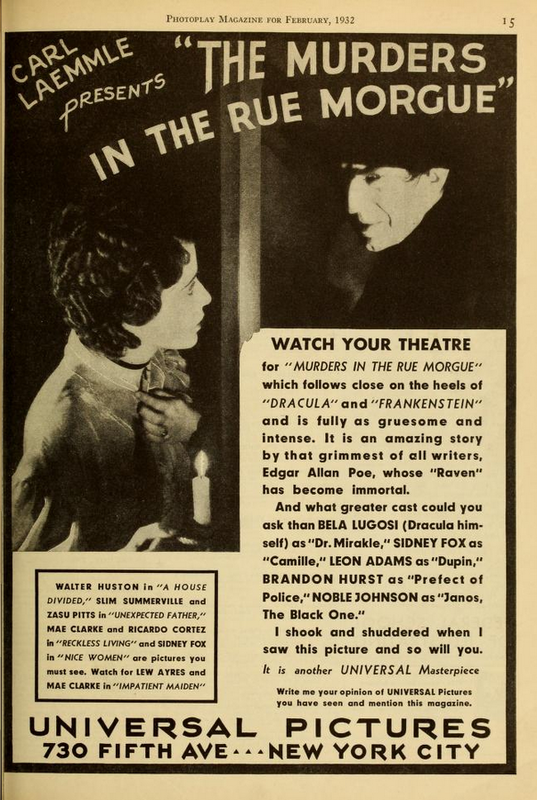 Universal Studios’ first adaptation of an Edgar Allan Poe story added the character of Dr. Mirakle, a crazed scientist obsessed with proving his mad evolutionary theory, for Lugosi. 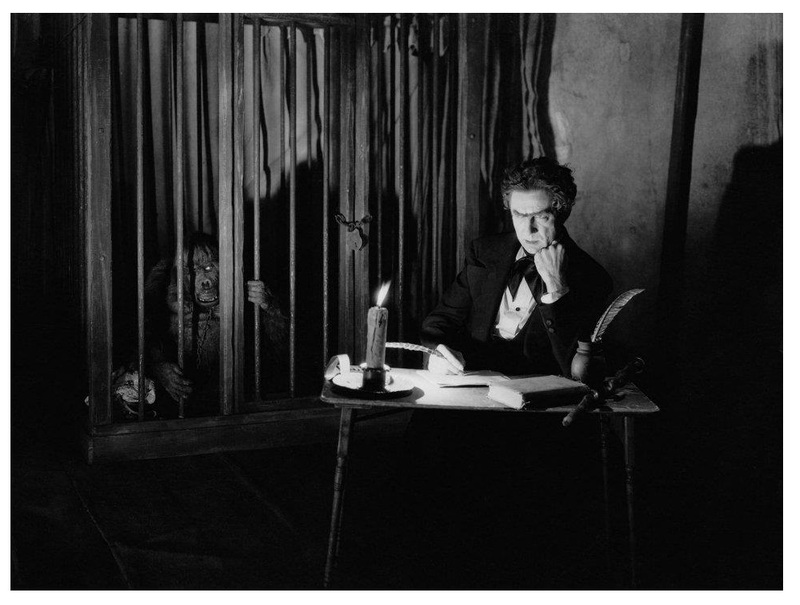 Before filming Murders in the Rue Morgue both Lugosi and director Robert Florey had started preparatory work on Frankenstein. 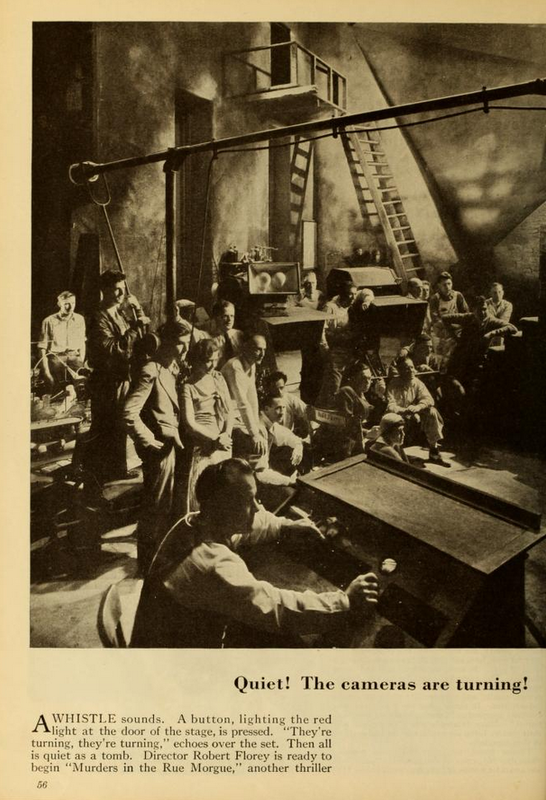 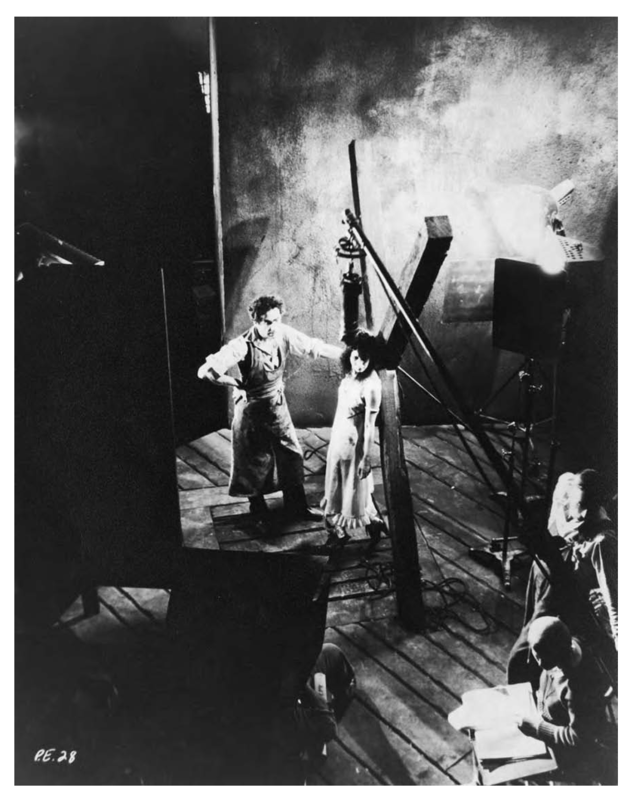 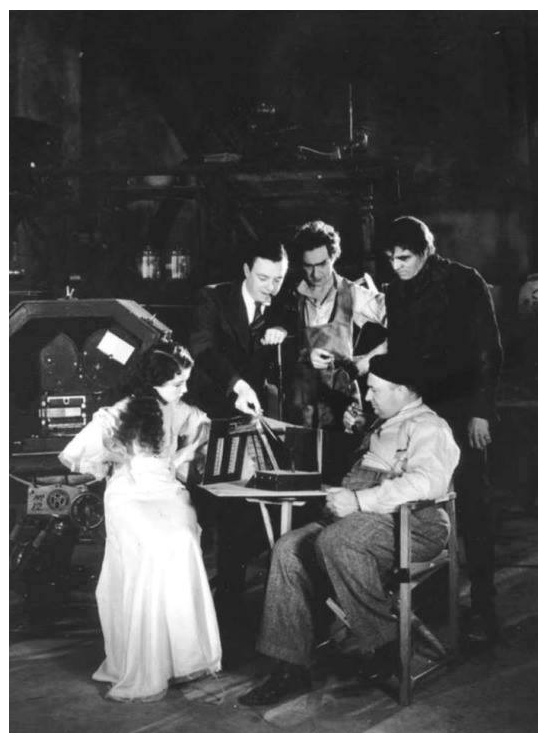 They shot a now presumed lost test reel before first Florey was replaced by James Whale and then, in unclear circumstances, Lugosi himself left the project to be replaced by Boris Karloff. 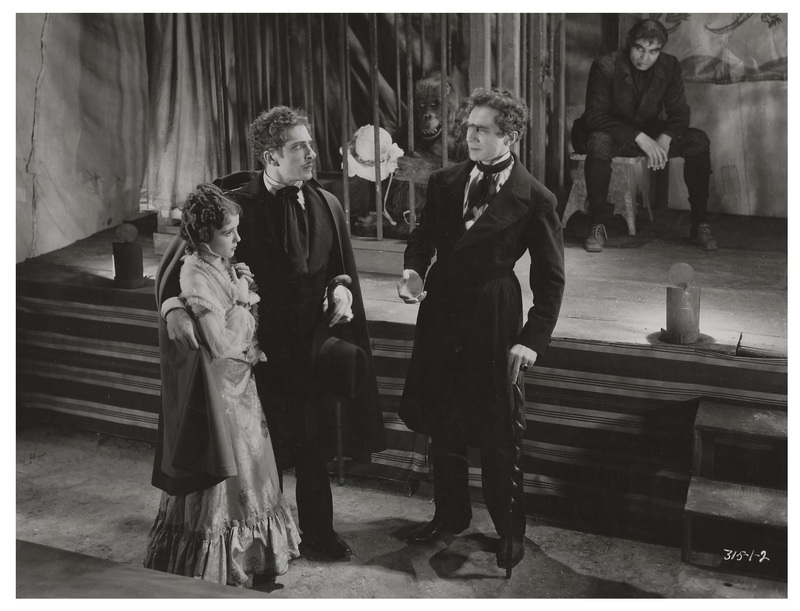 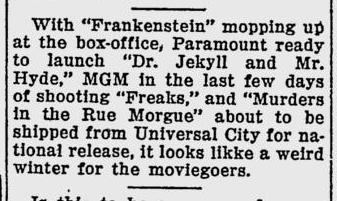 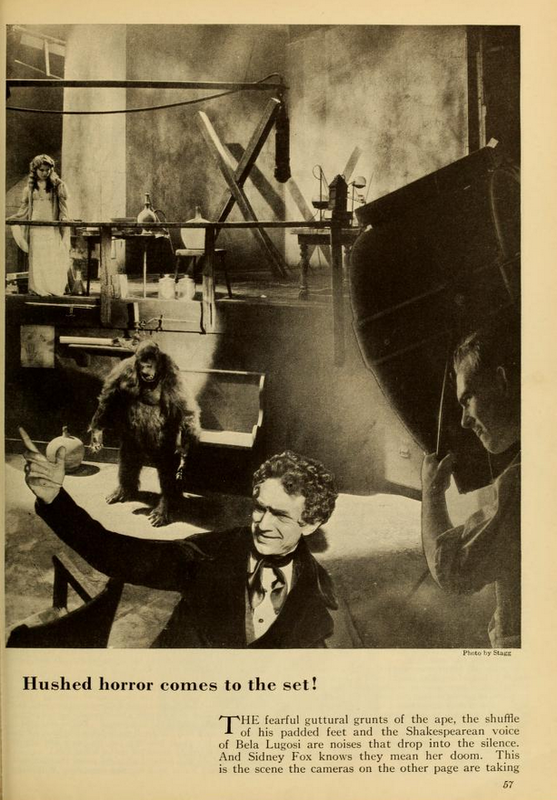 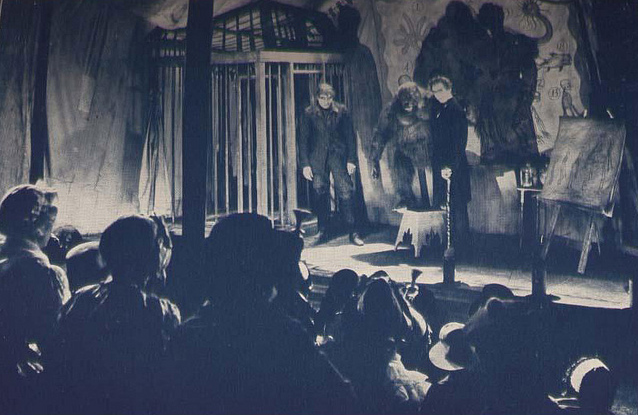 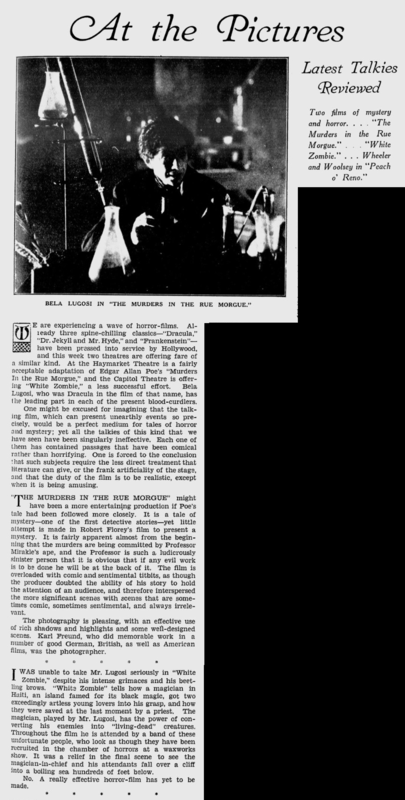 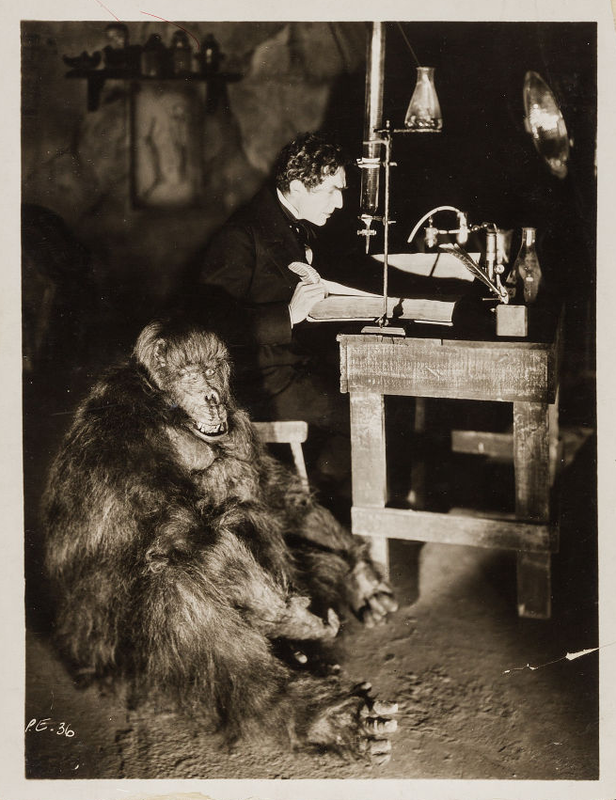 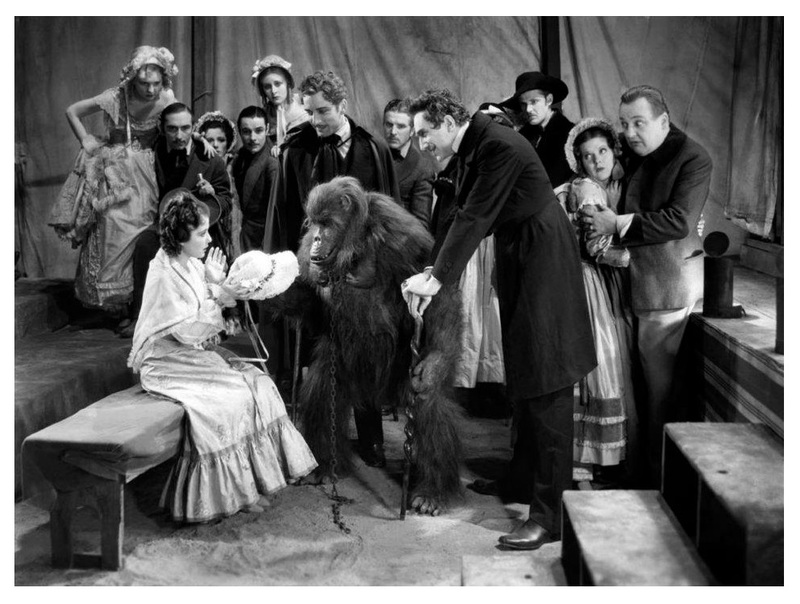 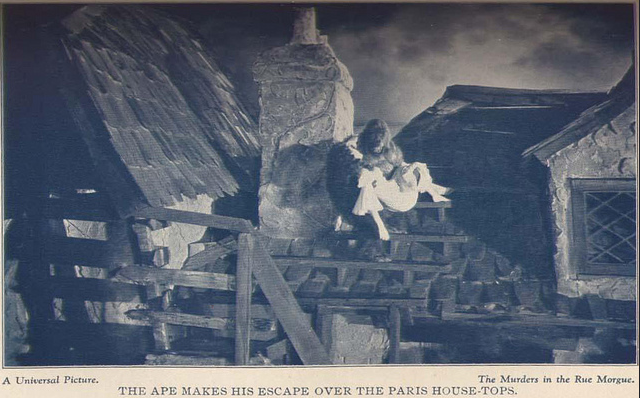 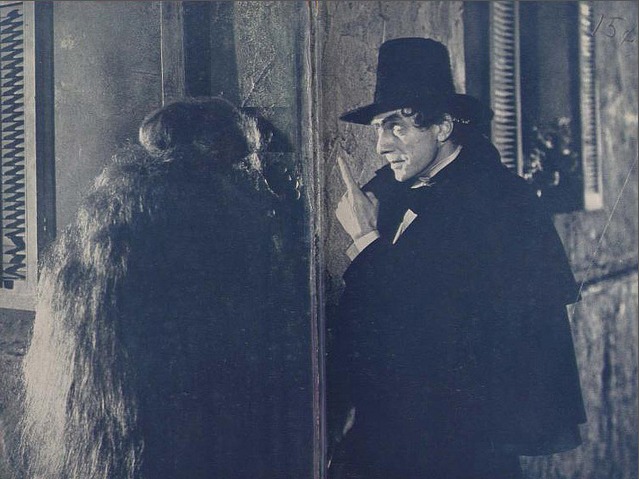 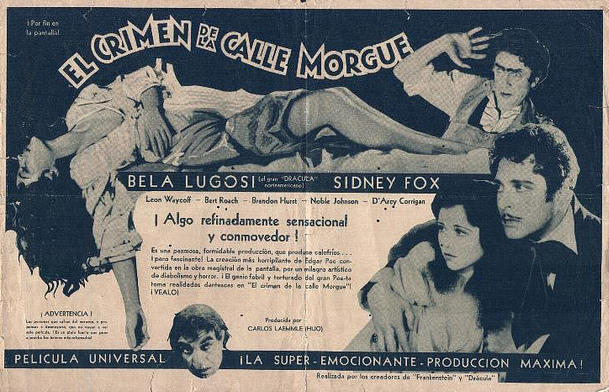 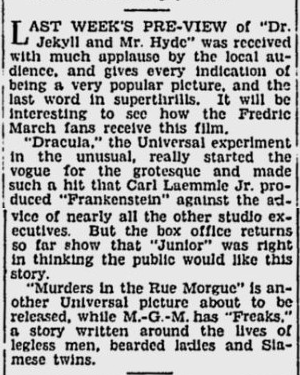 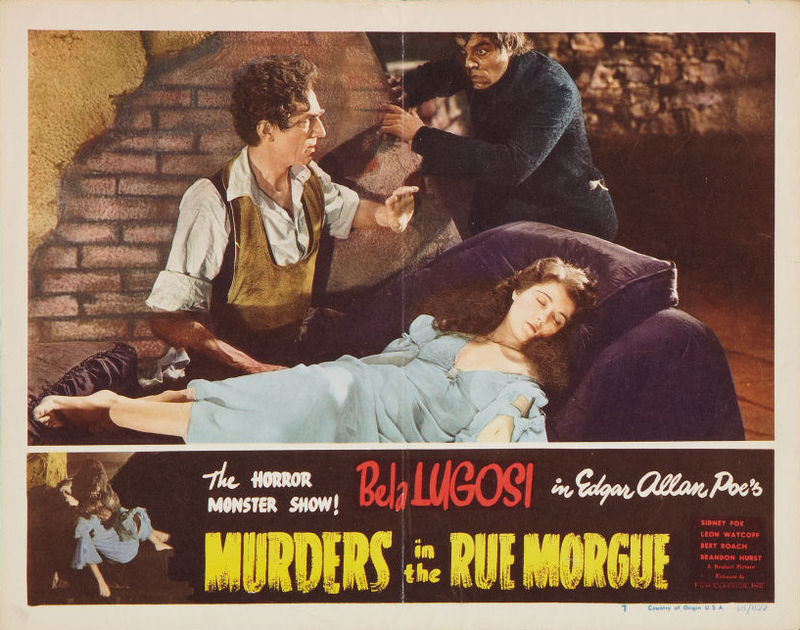 It has often been reported that Murders in the Rue Morgue was offered to Lugosi as a consolation for losing the role in Frankenstein, but his participation in a version of the story had already been circulated in the press before he began work on Frankenstein. 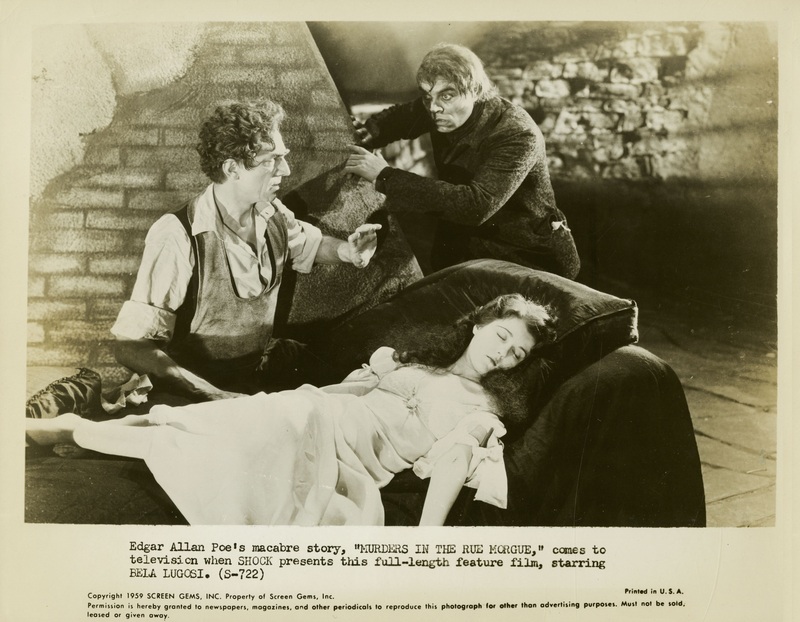 For more details of the Frankenstein saga, see Bela Lugosi Unrealised Projects. 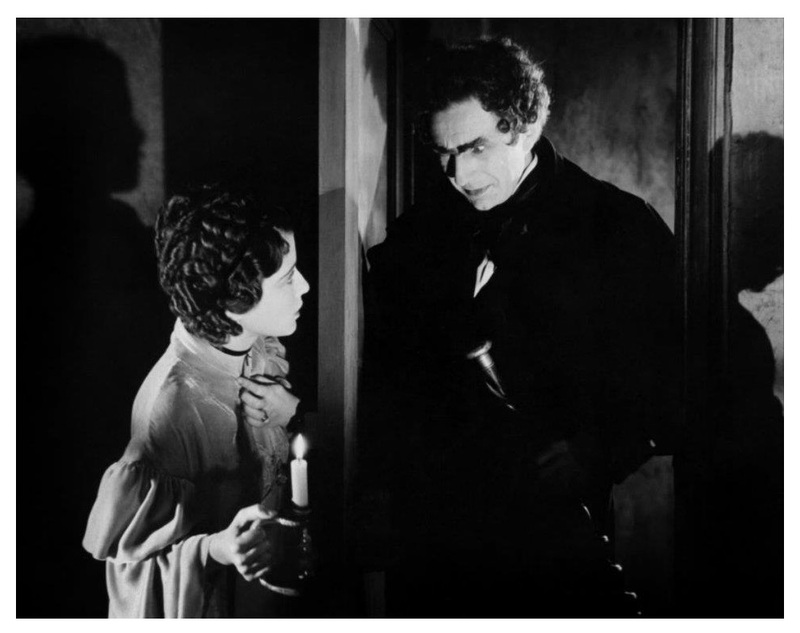 Bela Lugosi who won international fame for themselves by creating the role of Count Dracula in the first stage, to bring the character phenomenal on the screen, one of the outstanding stars of Hollywood current is. 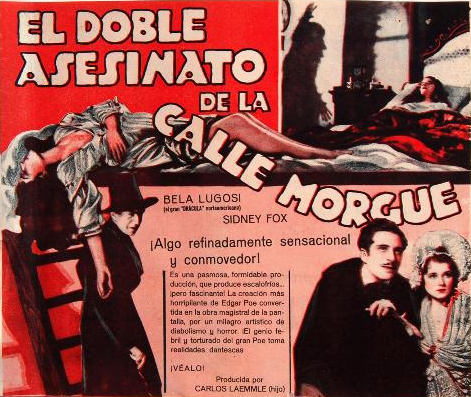 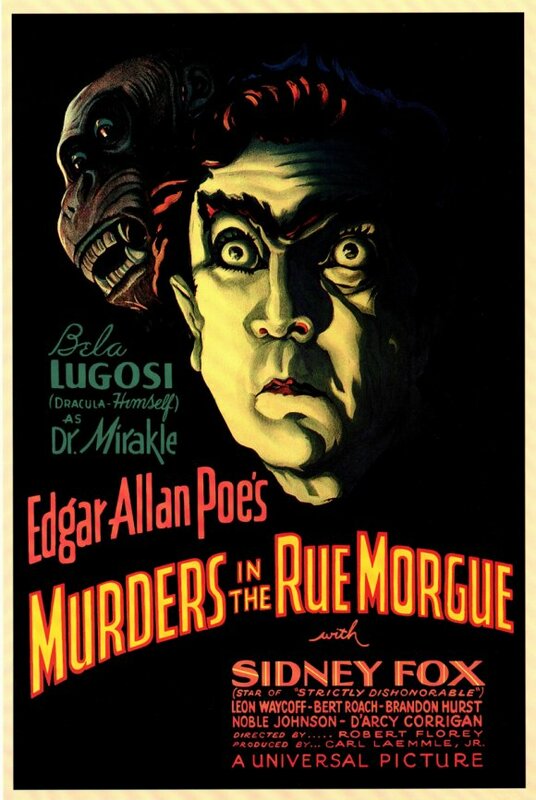 To appear next season in the production of the film thriller of Edgar Allan Poe he “Murders in the Rue Morgue.” October 20, 1884, was born in Lugos, son Baron Lugosi, the banker, went to the Performing Arts Academy of Budapest and high school Lugosi Hungary. 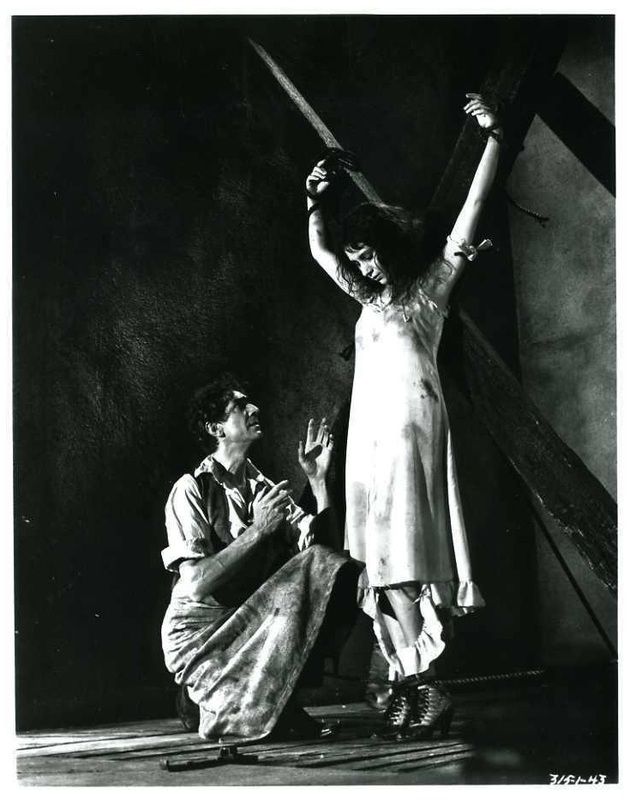 The stage debut as his Romeo Hungary production of “Romeo and Juliet”, he was followed by three years of classic repertoire of other Shakespeare, Ibsen and 20. 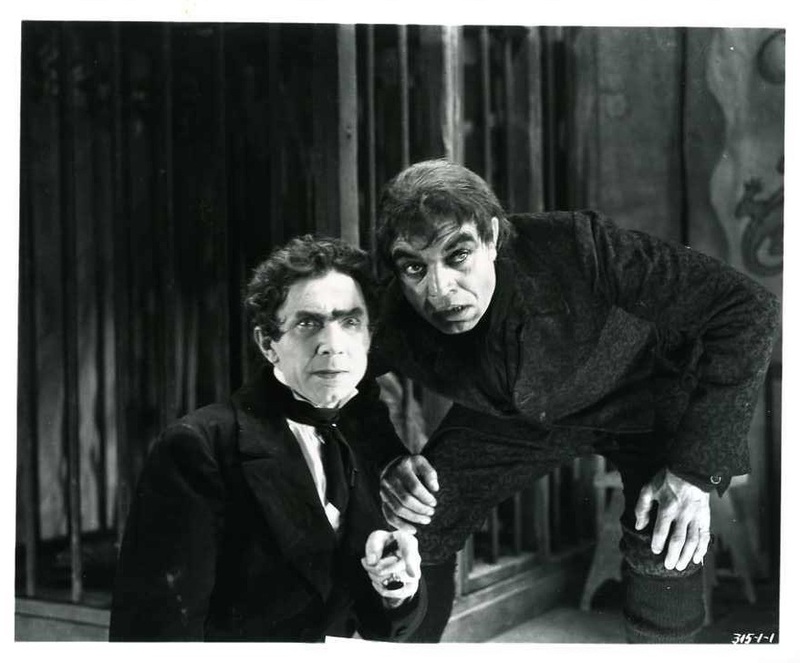 He said, “Camille” played Armand in the Hungarian version of the modern I speak a little English The red “Poppy, even if you do not speak more than a few words in English, to come to New York, Lugosi is, second of. 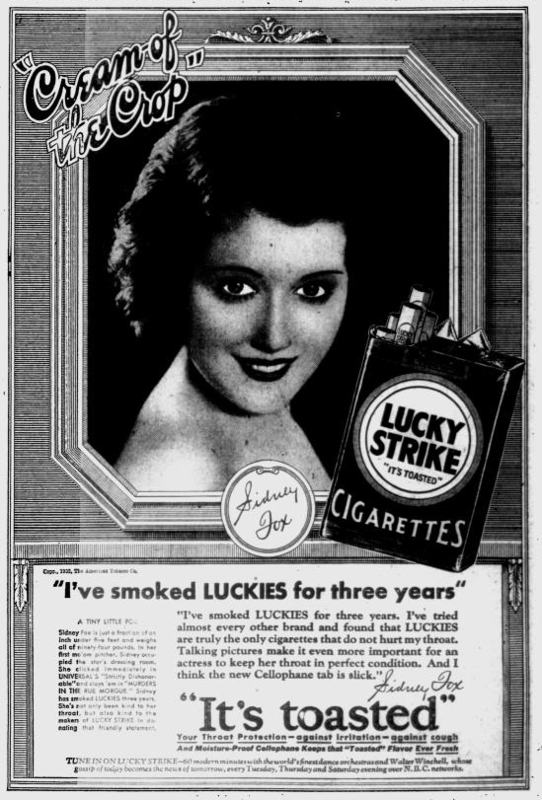 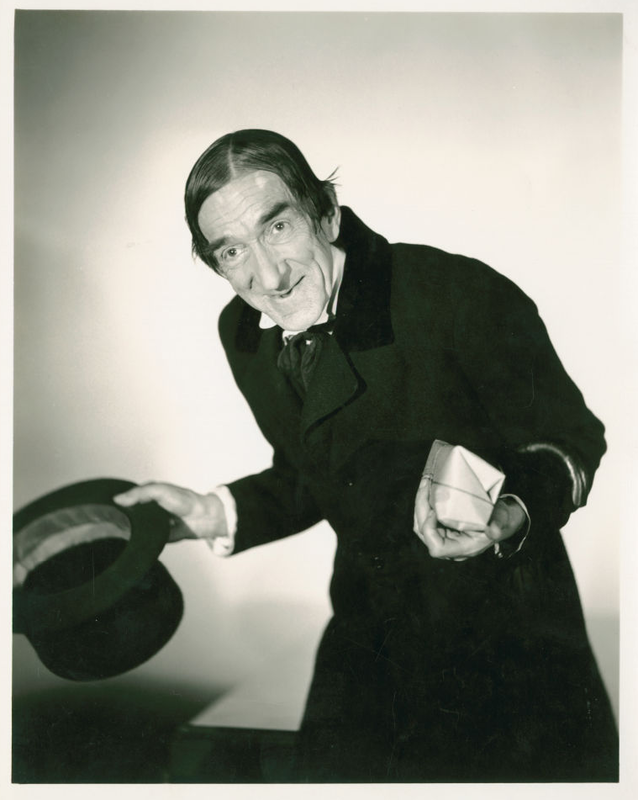 He appeared in English apeaking play his first his 1925” In the past Broadway appearance was the leading role of “Arabesque”, read “cheese devil.” It was a performance of fifth as Count Dracula in “Dracula” at the Fulton Theatre and “Open House” was followed by this. 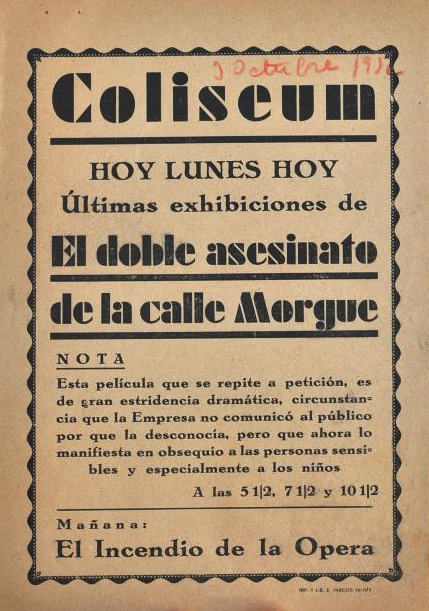 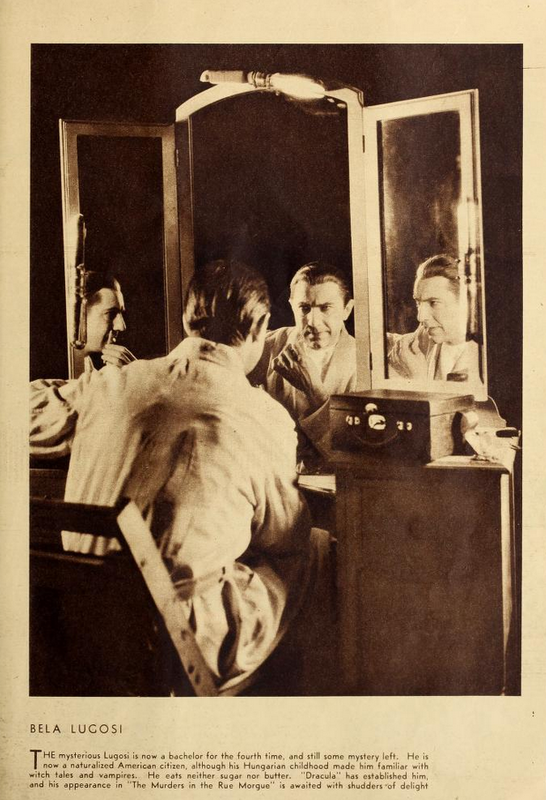 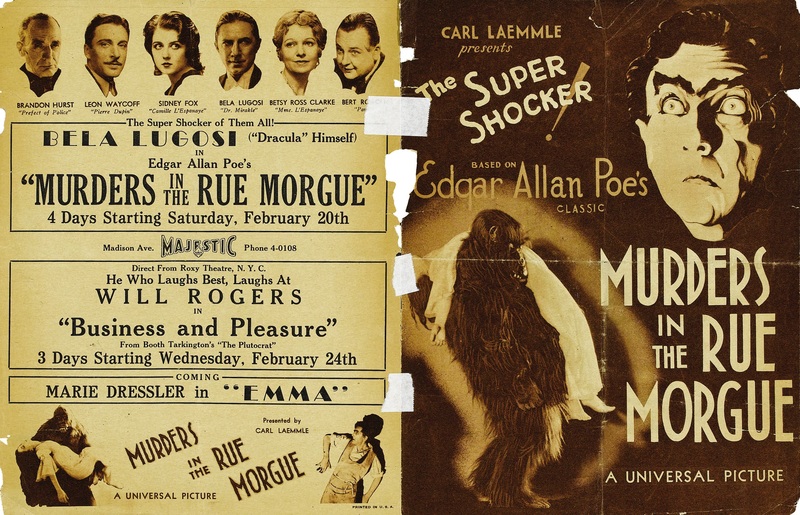 In New York, after almost two years in the east, built-in music box theater in Hollywood, Los Angeles, and Lugosi played a 8 weeks at 4 weeks. 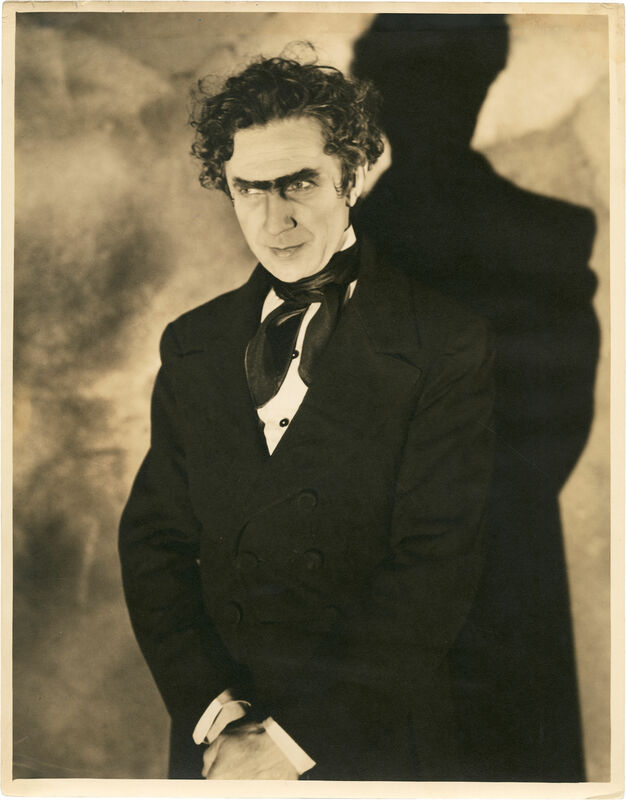 Lugosi has hair dark brown eyes and dark blue weigh high 6 feet 1 inches tall, the weight of 179 pounds. 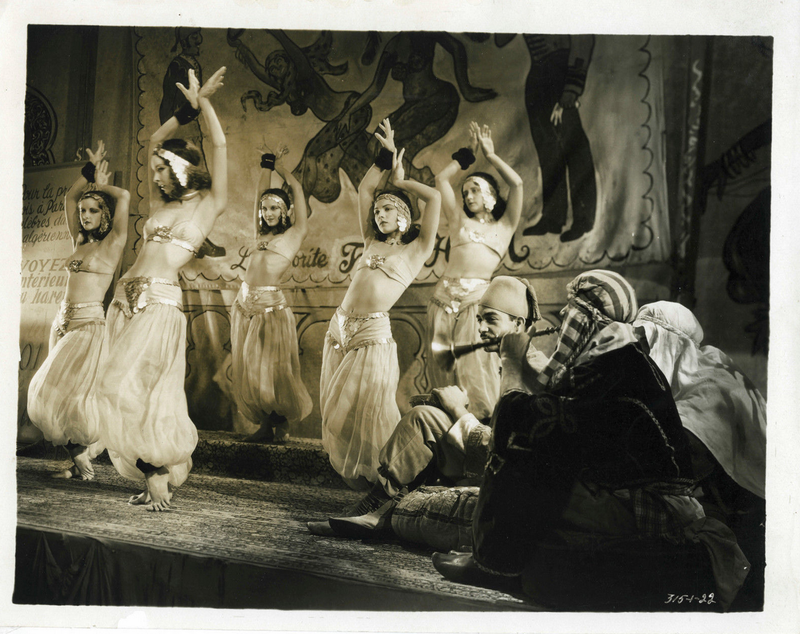 He has a voice with a heavy accent on the last syllable lyrics dancers and musicians and skilled. 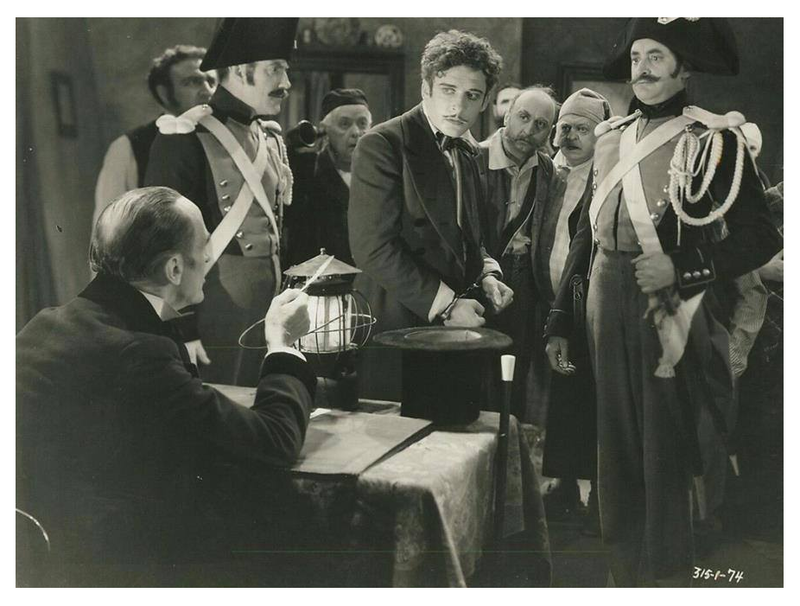 Provides services to two and a half years, he Durinng war was lieutenant of infantry first in Hungary. 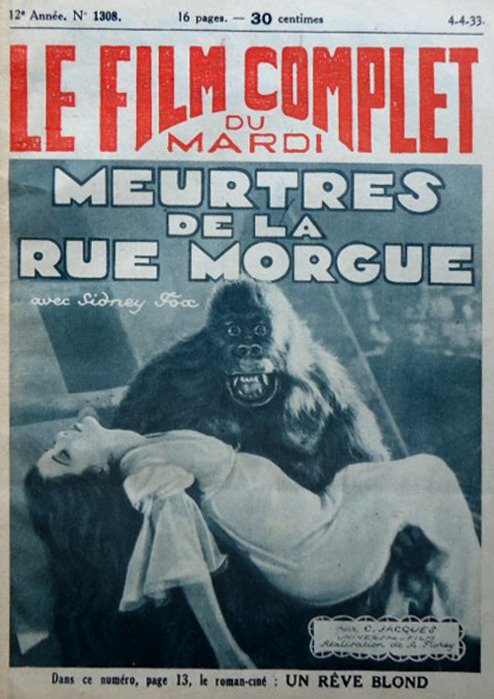 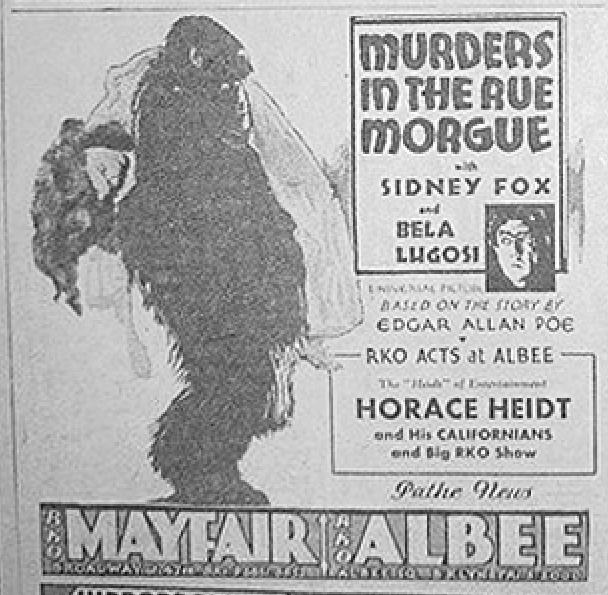 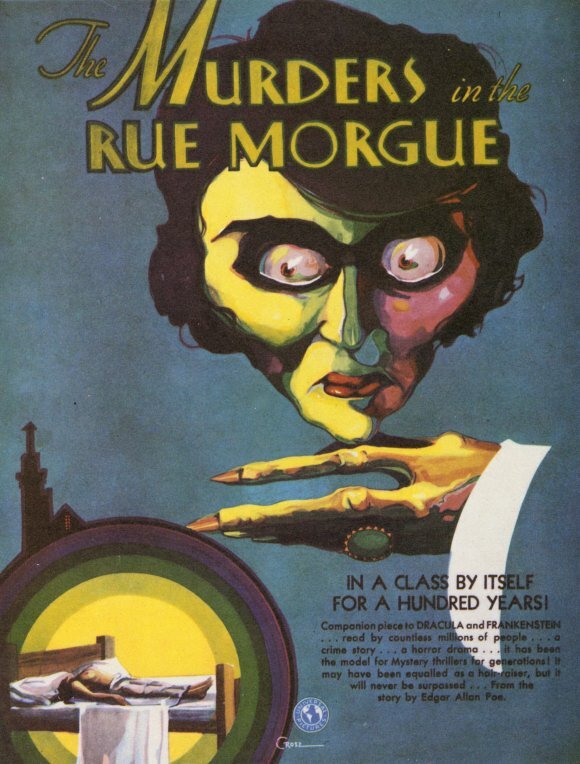 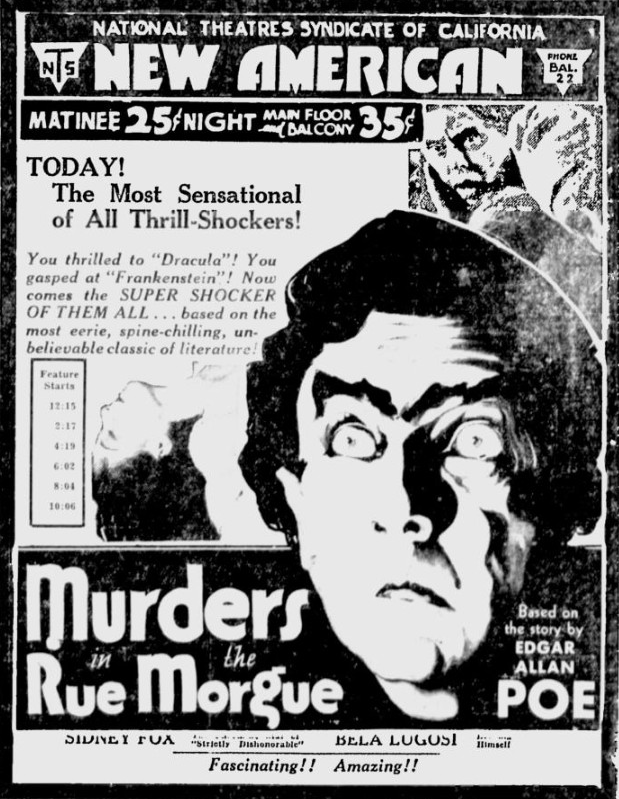 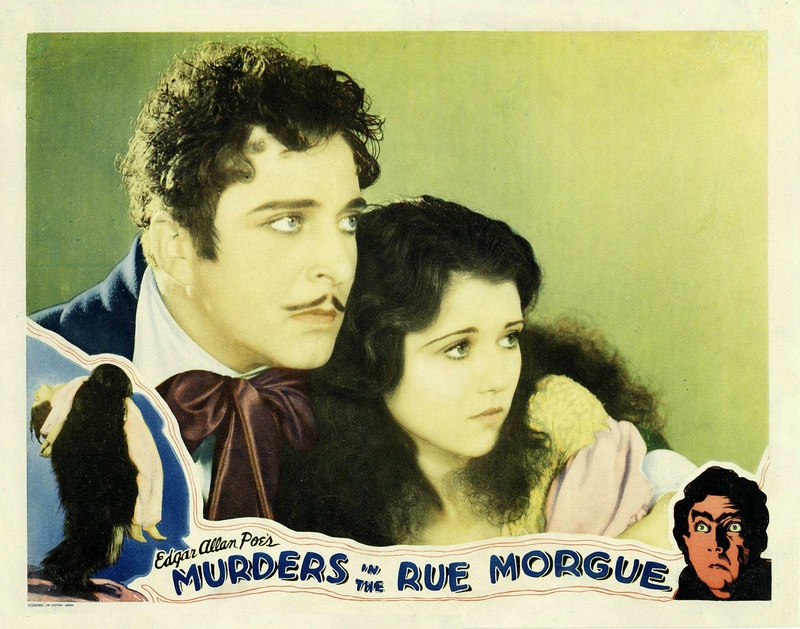 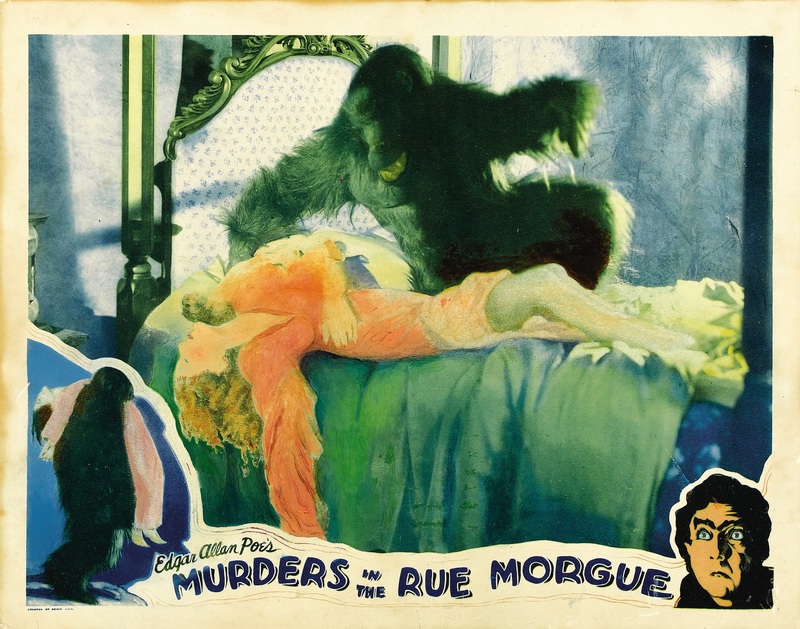 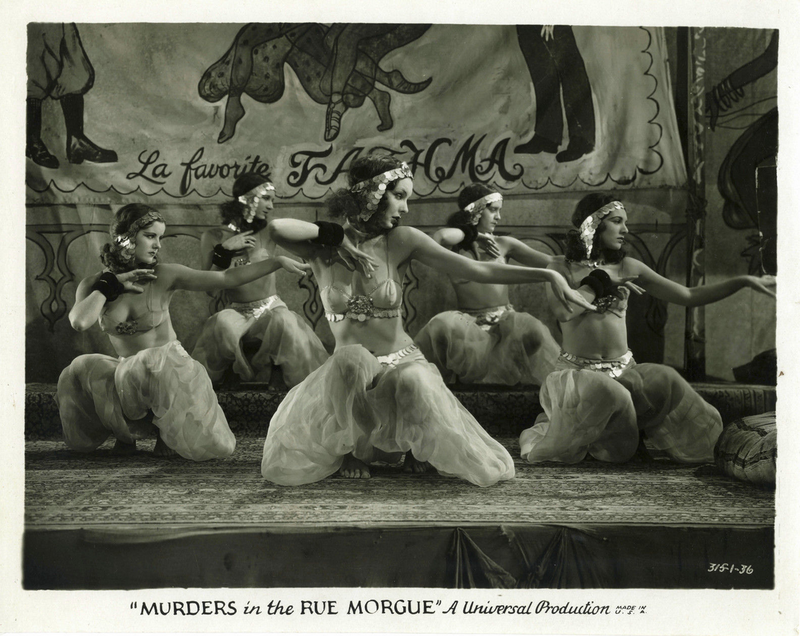 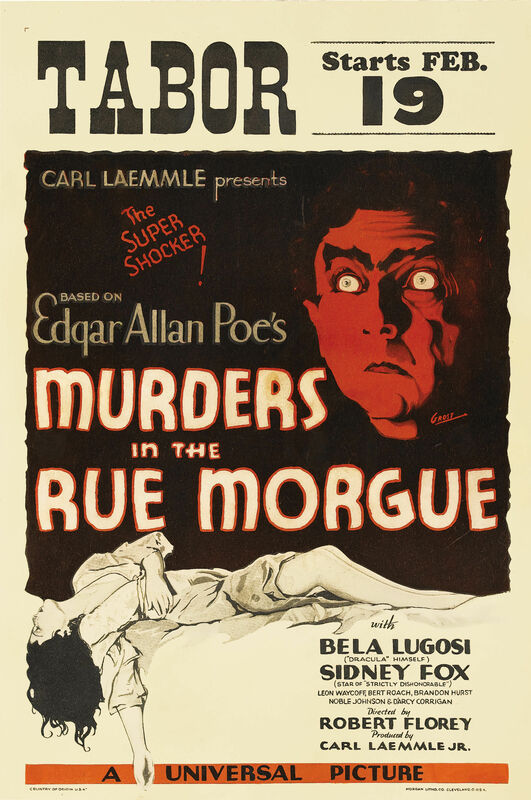 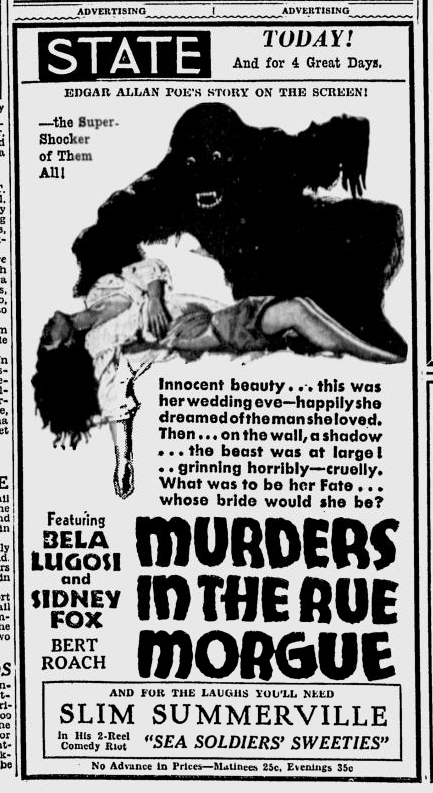 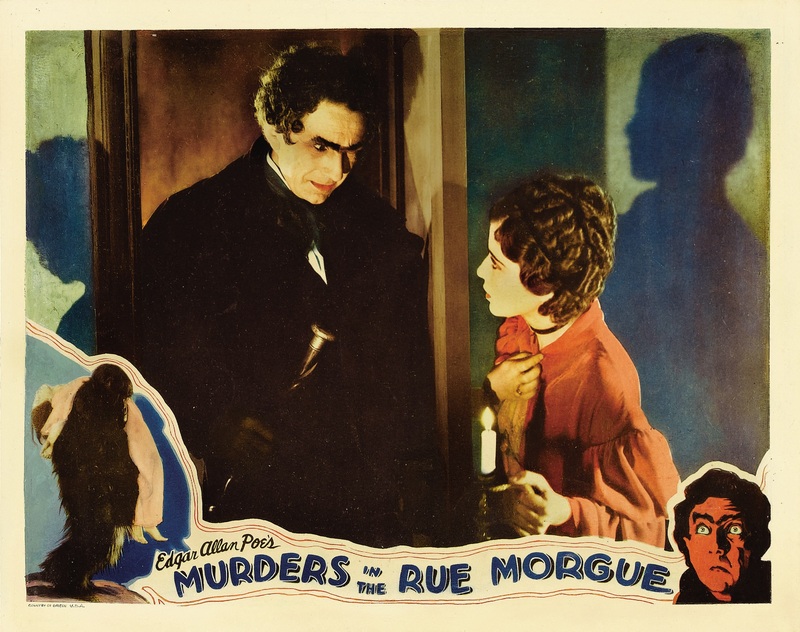 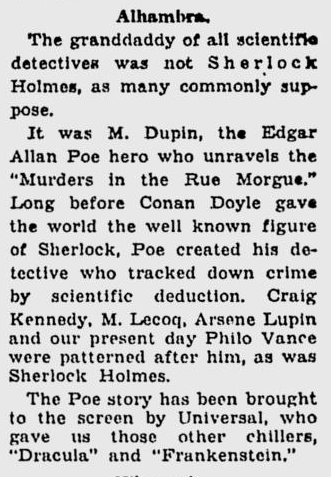 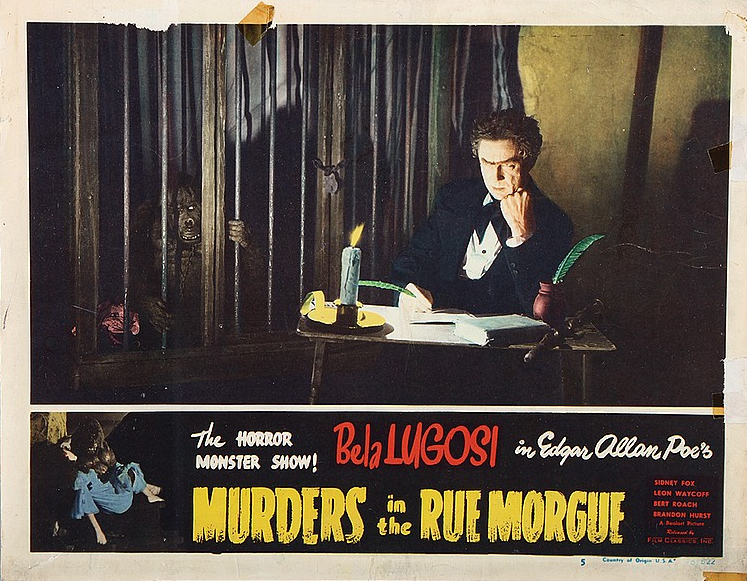 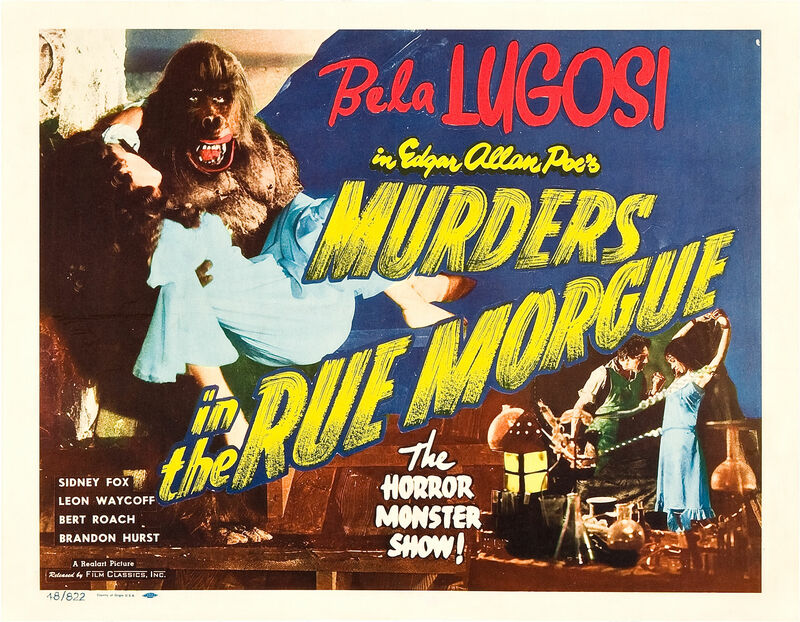 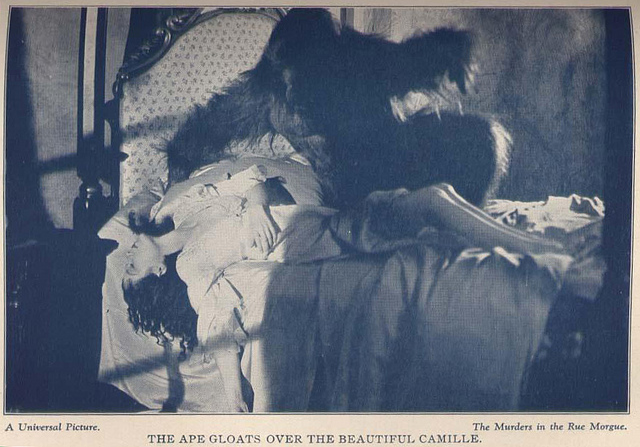 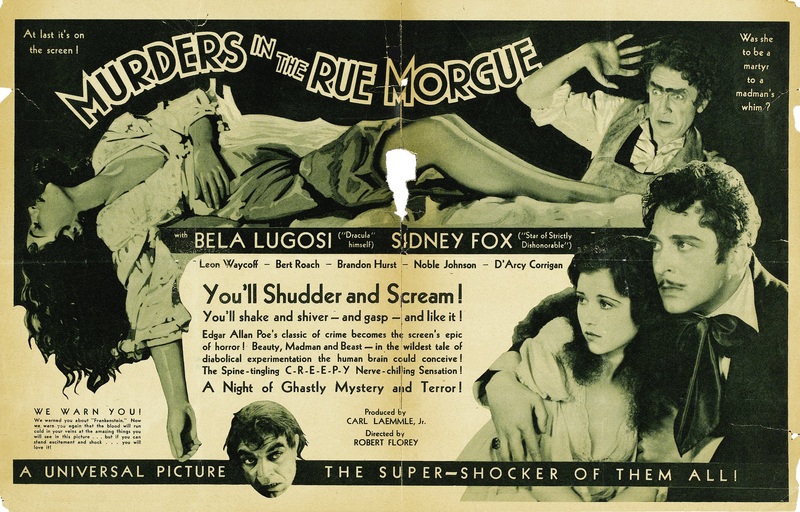 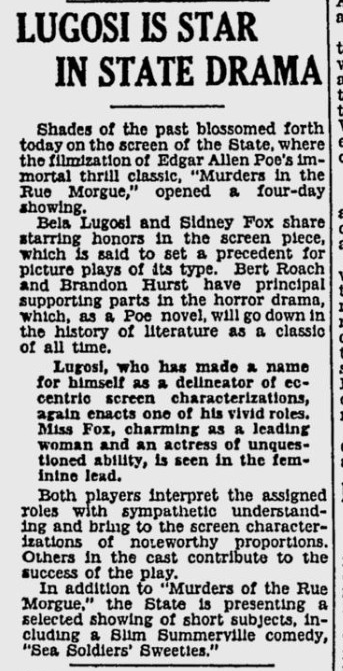 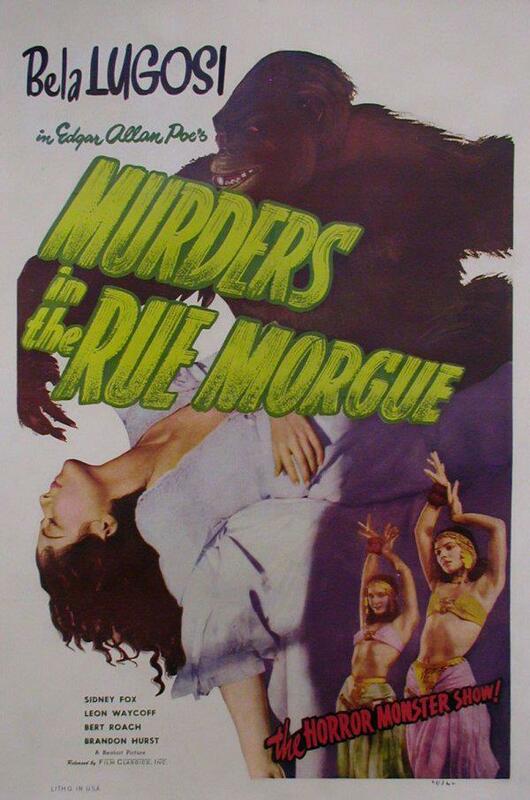 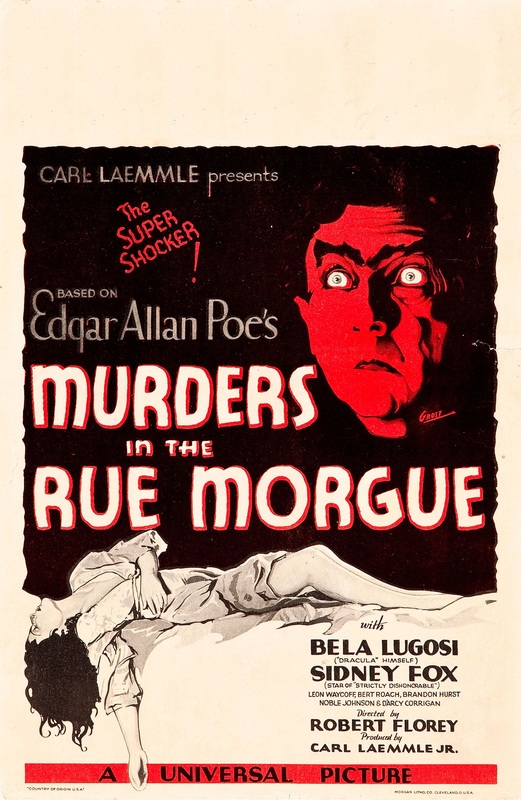 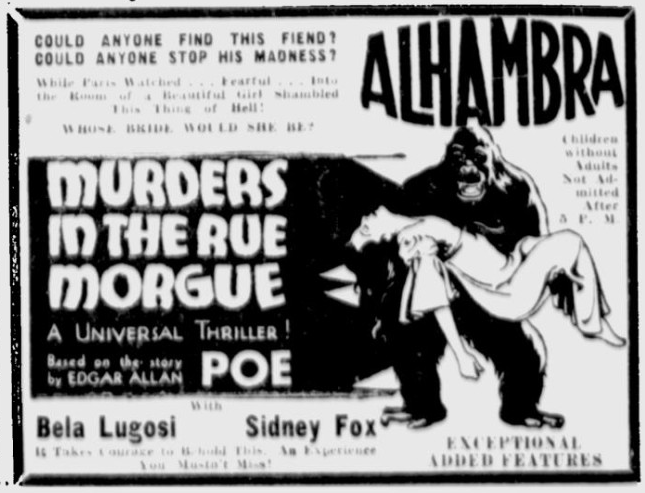 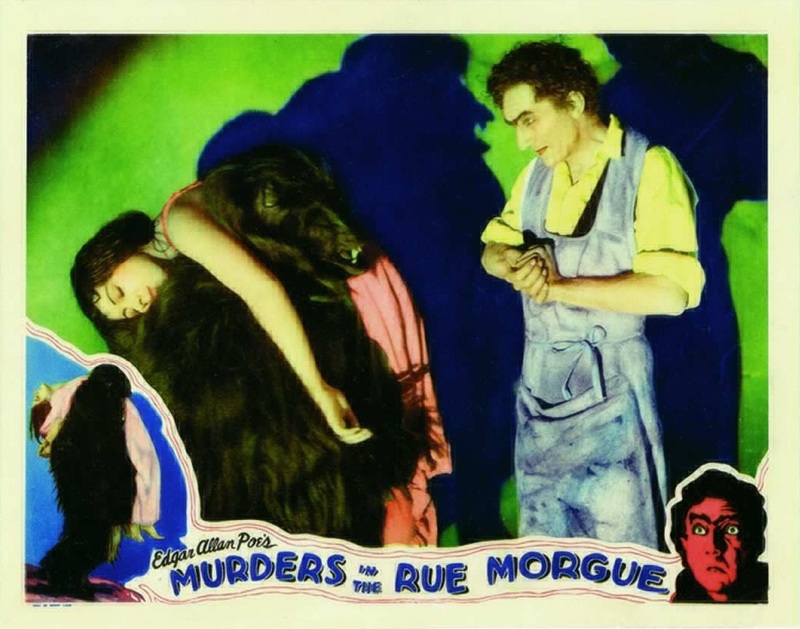 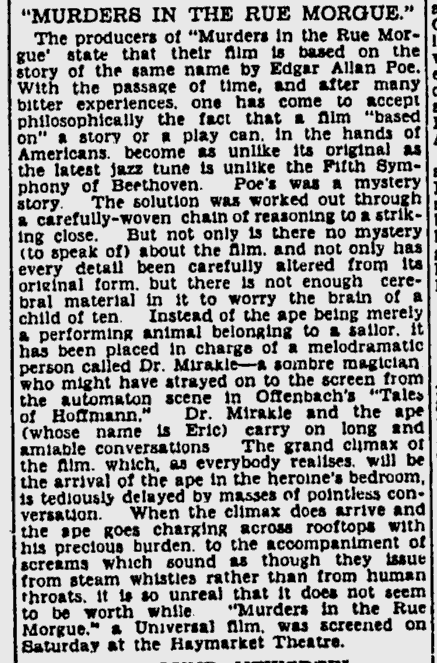 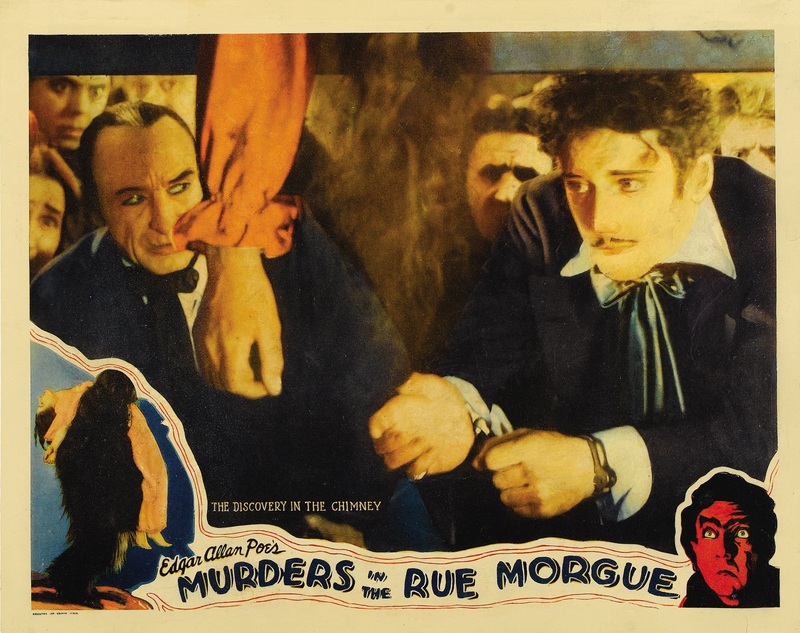 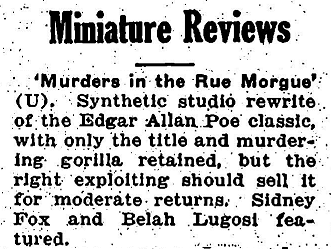 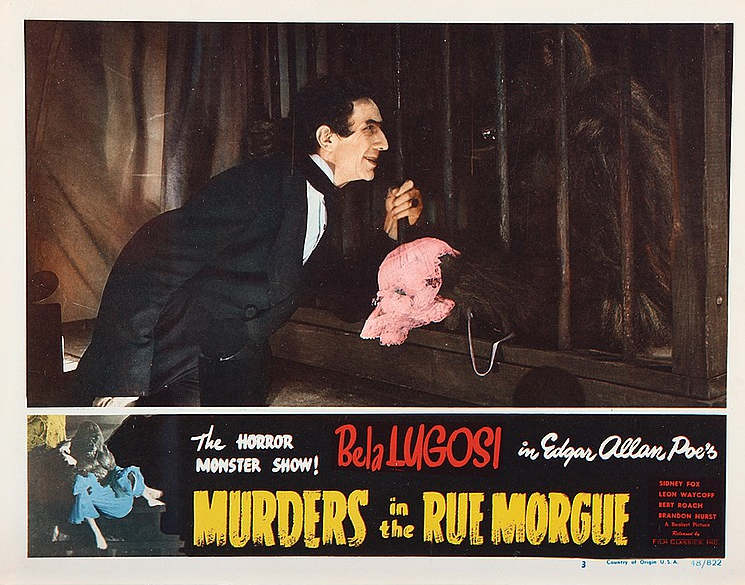 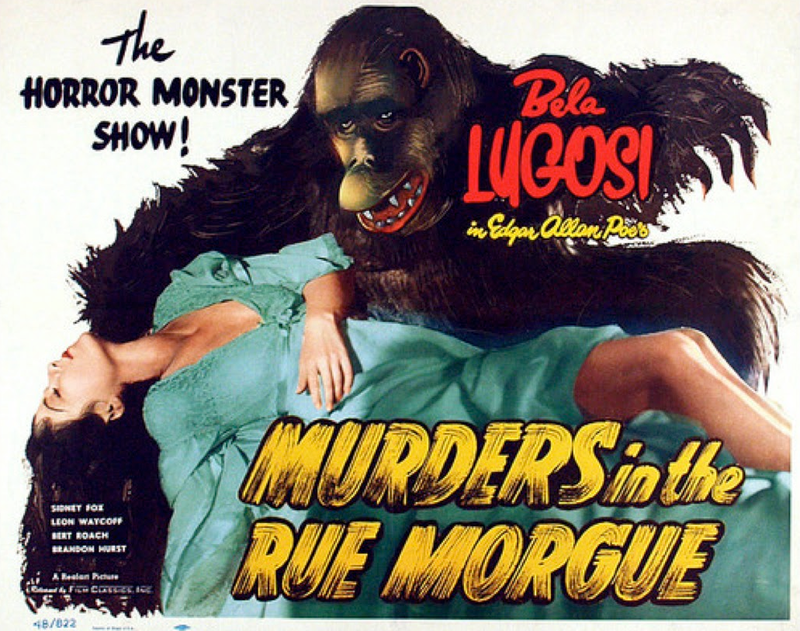 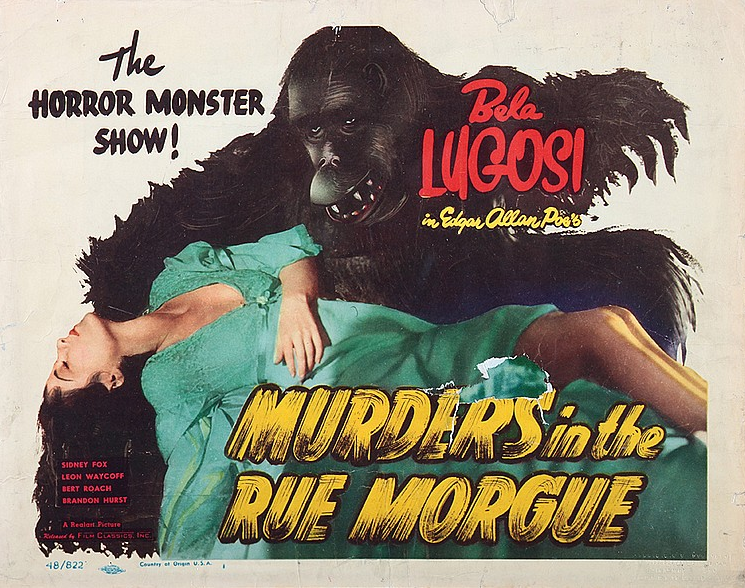 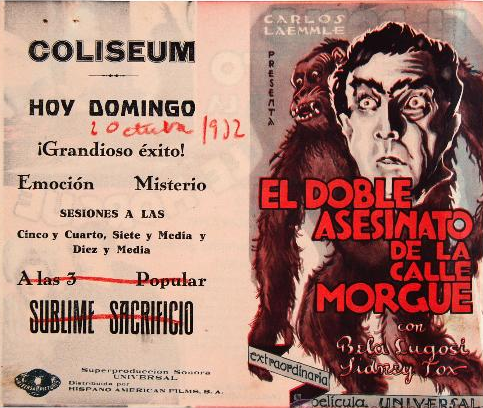 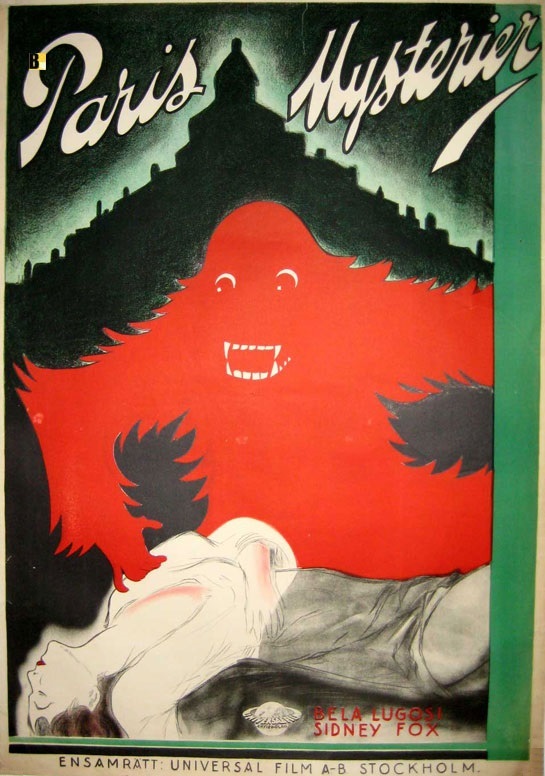 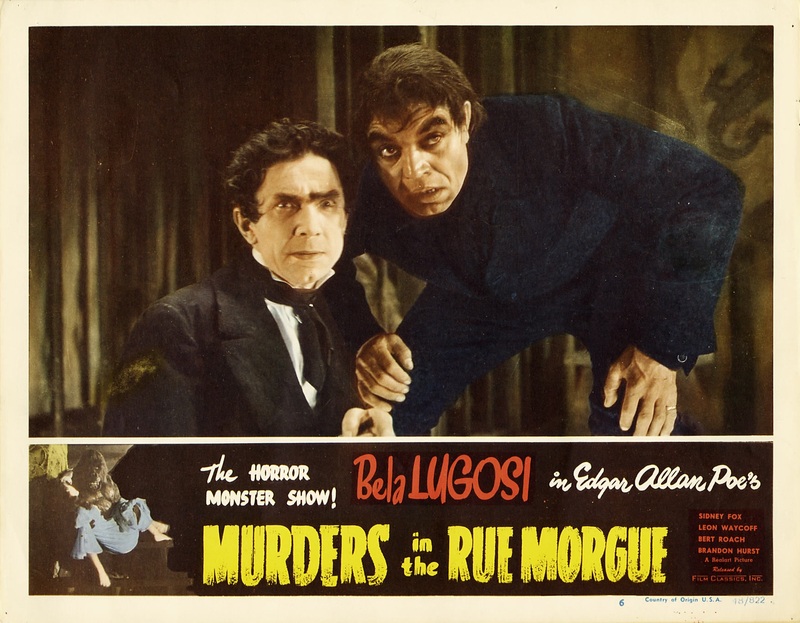 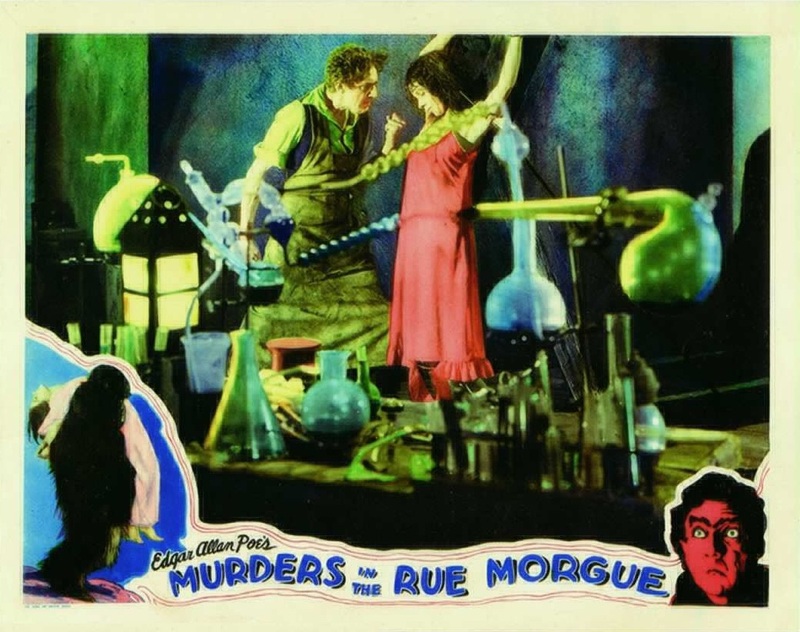 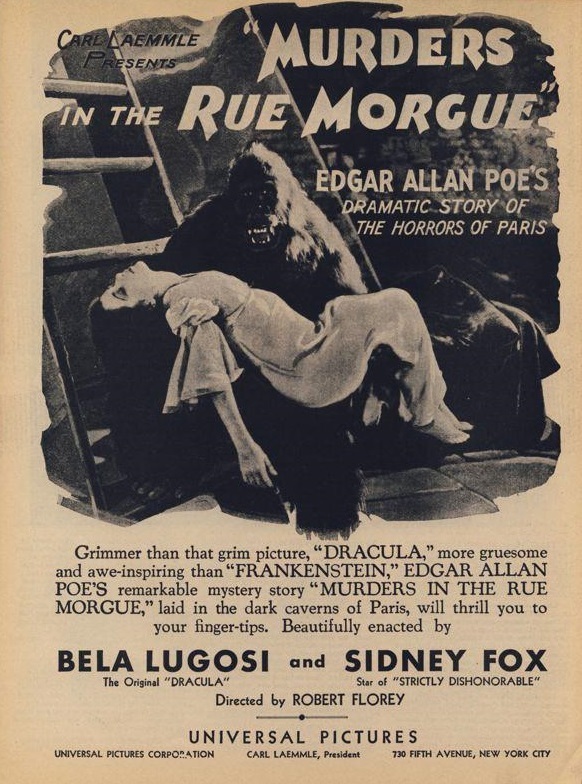 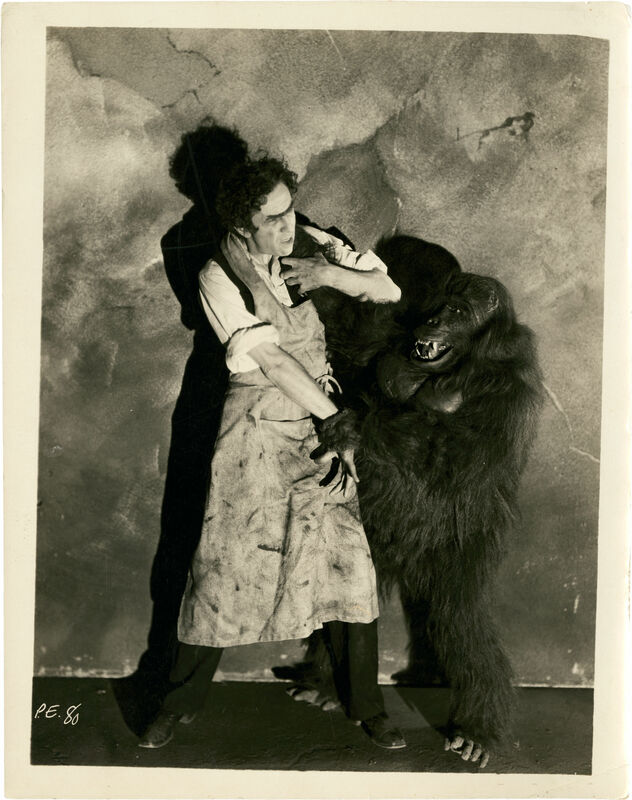 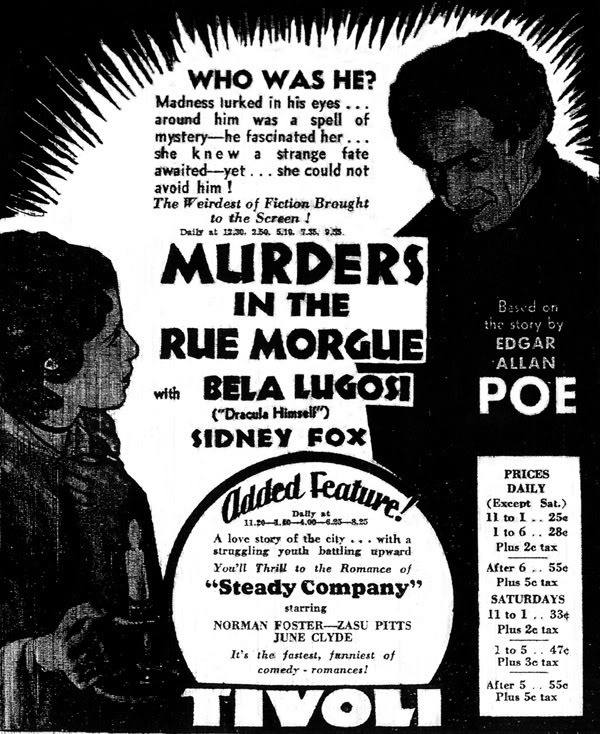 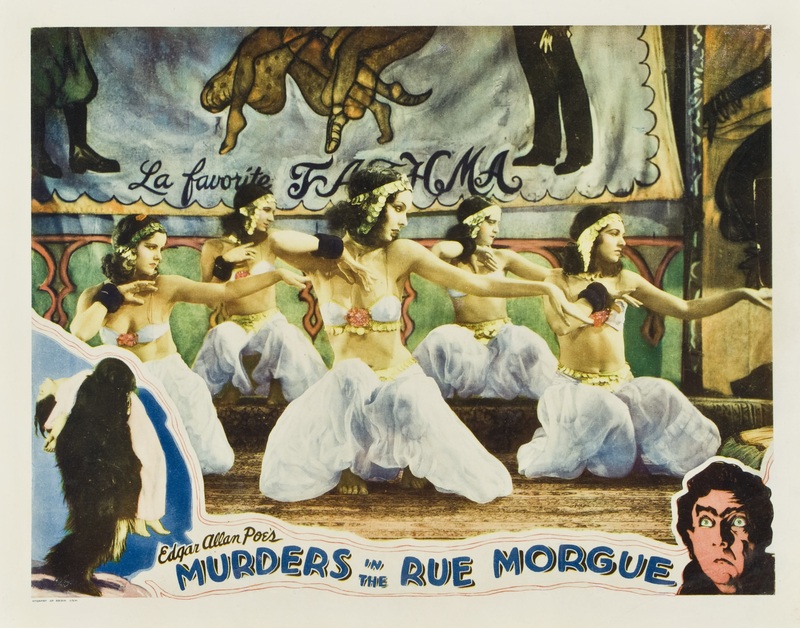 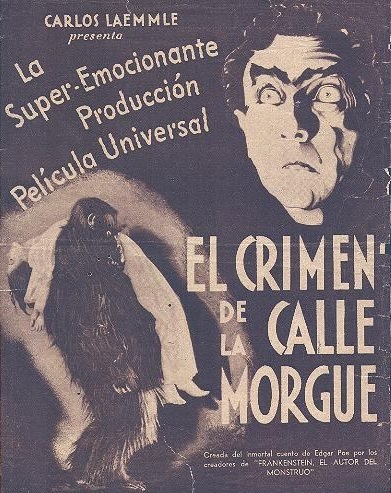 “Murders in the Rue Morgue,” which was offered at the Mayfair Theatre last night, represents a collaboration between Edgar Allan Poe, Tom Reed and Dale Van Every. 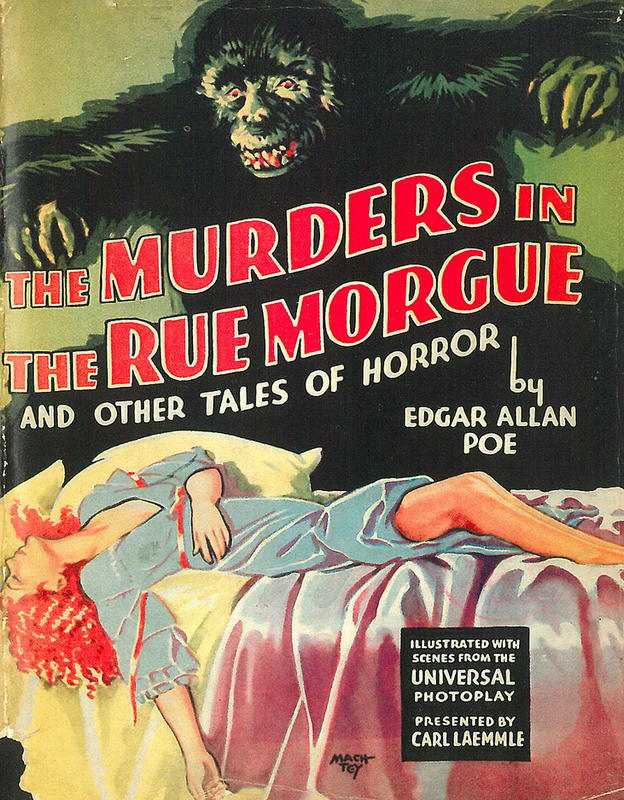 Poe, it would seem, contributed the title and the Messrs. Reed and Van Every thought up a story to go with it. 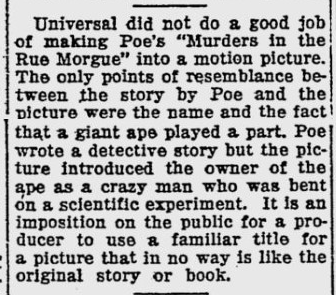 For this synthetic blood curdler, with its crazy scientist and its shadowy ape, is not in any important respect to be confused with Poe’s ratiocinative detective story.